A cookbook of delectable, comforting, French-inspired fare for home cooks and Francophiles everywhere, from the bestselling author of Duchess Bake Shop. 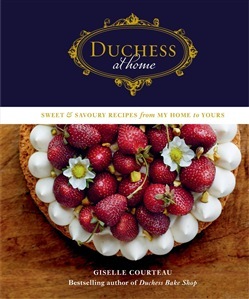 In Duchess at Home--a beautiful new cookbook from the founder of Duchess Bake Shop--Giselle Courteau draws on her French and French Canadian heritage to share the food she loves to make most for her family at home. Warming soups and stews, hearty breads, and flavourful preserves fill the pages of this beautiful volume--plus, of course, plenty of recipes for her delicious sweets and desserts--from tourtière to tarte au fraises, and everything in between. With chapters for breakfast and lunch, French favourites and Quebecois cuisine, dishes for Christmas and special occasions, and even recipes inspired by the produce in Giselle's own garden, this is a cookbook that you'll turn to for inspiration all year long. Every recipe is quadruple tested, and completely achievable for home cooks. Even crafting a croquembouche becomes attainable with Giselle's careful step-by-step instructions, process photos, and templates! Cooks and bakers everywhere will enjoy cooking their way through every one of these 75 mouthwatering French-inspired recipes. Withits thoughtful writing, stunning photography and design, and classic, fail-proof recipes, Duchess at Home welcomes you home to Giselle's kitchen--and is sure to become a mainstay in yours for many years to come. Acquista Duchess at Home in Epub: dopo aver letto l’ebook Duchess at Home di Giselle Courteau ti invitiamo a lasciarci una Recensione qui sotto: sarà utile agli utenti che non abbiano ancora letto questo libro e che vogliano avere delle opinioni altrui. L’opinione su di un libro è molto soggettiva e per questo leggere eventuali recensioni negative non ci dovrà frenare dall’acquisto, anzi dovrà spingerci ad acquistare il libro in fretta per poter dire la nostra ed eventualmente smentire quanto commentato da altri, contribuendo ad arricchire più possibile i commenti e dare sempre più spunti di confronto al pubblico online.